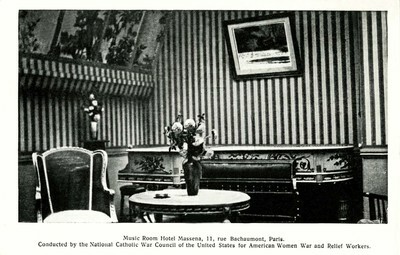 "Paris - Music Room Hotel Messena"
Music Room Hotel Messena, 11, rue Bachaumont, Paris. Conducted by the National Catholic War Council of the United States for American Women War and Relief Workers. One black and white postcard with a divided back. The postcard was published by Lecram Press for the National Catholic War Council.